Stand behind every patch of ingredients that is used in making products and every lab tests to ensure products are safe and effective. Constant innovation through research to incorporate emerging products and ingredients matching new health trends. Provide the best ingredients for the best products (USP grade quality). Guide customers towards better health & wellness. Share the values of Wealth & Health towards the less fortunate by donating to charities and organizations. 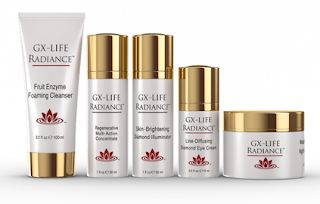 The skincare line consists of five products. I tried out four of them. Below are my reviews of the four products. 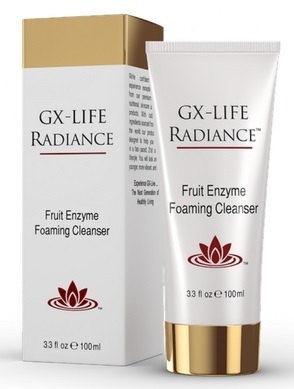 Renew your skin with GX-Life Fruit Enzyme Foaming Cleanser. This cleanser penetrates facial pores with a gentle foaming agent to flush out dirt, makeup, and other irritation-causing debris. It will leave your skin feeling clean, new and improved thanks to the power of enzymes and other ingredients. It contains Aloe Vera to soothe irritated and damaged skin as well as stimulate the fibroblasts in the skin, which helps to strengthen the skin's outer layers as they renew themselves. Bromelain is an enzyme that comes from pineapples and is a powerful anti-inflammatory and anti-swelling agent. It gets rid of dead skin cells and impurities in the pores. Papain is also an enzyme. It is extracted from papayas. And it is an effective exfoliating ingredient that removes dead skin cells, thus improving skin's texture. Cucumber Extract is considered useful to help decrease puffiness around the eyes, help soothe the skin, and to help potentially suppress the process that leads to hyperpigmentation. Sodium Hyaluronate is a form of Hyaluronic Acid, which is an extremely versatile molecule that is naturally present in the human body. Hyaluronic Acid is a humectant capable of of holding 1,000 times its own weight in water, which means it helps to hydrate the skin. It also eliminates active oxygen-free radicals protected by UV rays, which helps protect the skin against damage. These effects help to keep skin plump and supple, for a more youthful look. Additionally, it even helps to promote the regeneration of injured skin, promoting collagen production. Cleanse face morning and evening. To use this cleanser, dampen skin and apply generously to skin. Massage into a light lather and rinse thoroughly with warm water. Towel dry. Follow with Regenerative Multi-Action Concentrate morning and evening. In the mornings make sure to use a SPF30 or higher. I find this cleanser to be quite pleasant. It is a lightly foaming clear gel cleanser that really does help get rid of makeup and impurities on the skin, leaving it feeling clean and soft. Because it is so strong, you really do not need a lot of cleanser to do the work, so one tube should last a while. This cleanser is good for breaking down extraneous dead skin cells that love to hang around on the skin and cause clogged pores, acne lesions such as blackheads, small pustules, etc. It is important to get rid of all of these things and to make your skin look as good as possible. It is not too strong and will not cause dryness when used correctly. I would recommend this for mature, dry, normal, combination and oily skins. It is said that the eyes are windows to the soul. 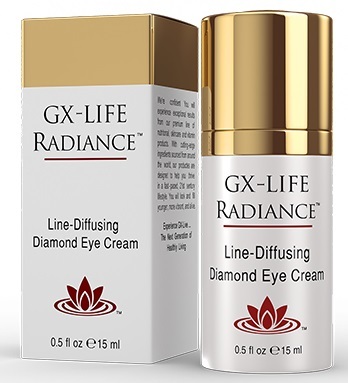 If you use GX-Life’s Line-Diffusing Diamond Eye Cream, those windows to the soul might just become a little bit brighter. The active ingredients like Beautifeye™ and Aldavine™ can protect your eyes from UV damage, prevent premature aging and even reduce the visibility of dark circles by 5x! 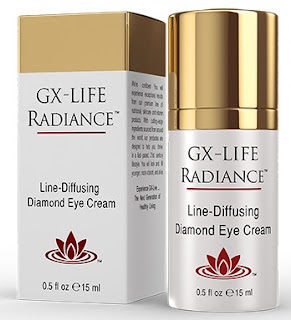 Give your eyes back their youthful radiance. This cream contains some wonderful ingredients that do work very well. Allantoin is a naturally occurring nitrogenous compound found in the roots of the Comfrey plant that increases moisture retention and skin softness while soothing any irritated skin. Aldavine™ is derived from two unique algae species. It serves to protect and maintain the integrity of microcapillaries around the eye, therefore reducing dark circles and puffiness. Beautifeye™, is a composed extract from the bark of the Persian Silk Tree. It visibly lifts sagging upper eyelids and reduces the capillary leakages and accumulation of glycotoxic pigments responsible for the appearance of fatigue due to uneven coloration around the eye. Aloe Vera in addition to being commonly used to soothe irritated and damaged skin, helps to stimulate fibroblast growth in the skin, which strengthens the skin’s outer layers, also called the epidermis. Passionfruit Oil is rich in a wide array of useful vitamins and minerals. That includes Vitamin A, which promotes the formation of carotenoids, vital for cell growth and repair, and Vitamin C, which helps delay the damage caused by free radicals. SWT7™ is derived from the herbaceous plant, Andrographis paniculata. It is native to India and Sri Lanka. This plant stimulates stem cells and epidermal regeneration to blur the appearance of vertical wrinkles. I would recommend this for any skin type except oily and acneic skins. Use this eye cream morning and night. Apply sparingly above orbital bone, around and under the delicate eye area. Lightly pat under eyes to diffuse dark circles. 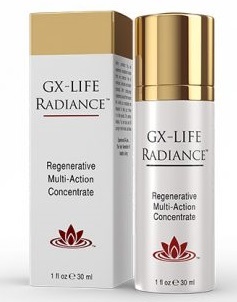 Follow with Regenerative Multi-Action Concentrate. At night follow with Moisture-Boosting Night Repair Cream. This eye cream is very nice. And you only need a very tiny amount for the whole eye. It does work quite well on dark circles, which I do suffer from. It also helps to lift sagging lids. My lids have always been heavy, so I cannot gauge on whether or not this would actually lift them up or not, since my problem is more of an excess skin issue, not a lack of elastin issue. 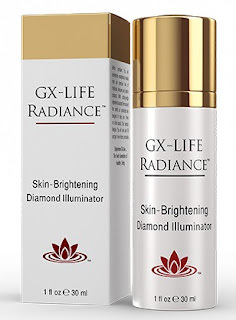 After using GX-Life’s Skin-Brightening Diamond Illuminator, you won’t have to be embarrassed of any kind of hyperpigmentation including: dark spots, acne marks, or other unsightly blemishes anymore. It has a combination of clinically proven proprietary ingredients, including groundbreaking compounds Brightenyl® and DermalRx® SRC, this product produces immediate and visible results. It contains Allantoin (mentioned above), a naturally occurring nitrogenous compound found in the roots of the Comfrey plant that increases moisture retention and skin softness while soothing any irritated skin. Alpha Arbutin helps to reduce the degree of skin darkening after any UV exposure, thus ensuring an even, lighter skin tone. Diamond Powder gives the skin a ‘soft-focus’ effect by reflecting light off of the skin, thus diminishing the appearance of fine lines, wrinkles, and dark spots. Brightenyl®, is a powerful antioxidant that brightens while providing photo protection for the skin. DermalRx® SRC gives the skin a ‘soft-focus’ effect by reflecting light and thus diminishing the appearance of fine lines, wrinkles, and dark spots. Safflower Oil is a natural, botanical emollient that effectively moisturizes by allowing the skin to better retain water. Sodium Hyaluronate (also mentioned above) is a form of Hyaluronic Acid, which is an extremely versatile substance naturally present in the human body. Hyaluronic Acid is capable of eliminating active oxygen-free radicals protected by UV rays, which helps protect the skin against damage. These effects help to keep skin plump and supple, for a more youthful look. Additionally, it even promotes the regeneration of injured skin. I would recommend this product for any skin type except oily and acneic skin types. To use, apply generously to skin twice daily to dark spots, scars and skin discolorations. Massage until fully absorbed. Follow with Regenerative Multi-Action Concentrate. This is the star product for the line in my book. I suffer from bad hyperpigmentation because of multiple sunburns in my childhood. So now I am paying for it. I have been working on brightening my skin over the past year and it has just gotten better and better. At this juncture I am not sure it will get much better. I have photodamage that will likely not go away. But this product did help some of the sun damage that I couldn't get rid of before. My skin is looking better than ever. What if you could turn back time? Well, with GX-Life’s Regenerative Multi-Action Concentrate, you can. Dr. J's exclusive assortment of peptides, ceramides, and other innovative ingredients helps firm the skin and reduce the visible signs of aging. This serum contains many of the same ingredients that are present in her other products. Dermaxyl™ utilizes ceramides, which are long chains of lipids that make up the skin’s outer layers, to stimulate cell communication, resulting in repairs to age related skin damage. Linefill™, obtained from the seeds of sesame plants, fills wrinkles and reduces redness, producing a rejuvenated appearance. Progeline™ made of peptides, increases skin firmness and elasticity, allowing for improvements in the appearance of skin sagging and fine lines and wrinkles. It also contains Allantoin, Safflower Oil, Diamond Powder and Sodium Hyaluronate, which were mentioned above. I would recommend this for any skin type except oily and acneic skins. To use this product, apply 1-2 pumps morning and evening. Apply to clean skin. Massage until fully absorbed. For best results, apply after Fruit Enzyme Foaming Cleanser for maximum absorption. At night follow with Moisture-Boosting Night Repair Cream. I really like this serum. It glides right across the skin and I have been using it with my Clarisonic Smart Profile. Then it sinks into the skin, leaving it feeling soft and beautiful. This is something that will help keep skin looking young and beautiful, keeping the lines, uneven skin tone, sagging and wrinkles at bay. I did not notice very many results but I do not have too many signs of aging yet except the hyperpigmentation. This product is not for that. But one still needs to prepare and take steps to prevent. Do you have dry or mature skin? Enrich your skin’s inner glow with GX-Life’s revolutionary Moisture-Boosting Night Repair Cream. Our proprietary blend of natural ingredients including Hydraporine™ and Lanablue® organically hydrates the skin to give you a soft and luxurious allure. It contains Hydraporine™ , which is a synergistic combination of natural ingredients, including: Honey, Pectin, Phospholipids, and Trimethylglycine. These ingredients penetrate cell membranes to moisturize and hydrate at the deepest level. Lanablue®, derived from blue-green algae of the Pacific Northwest, acts like a natural retinoid, smoothing and regenerating the skin without any unwanted side effects. Aloe Vera Gel, in addition to being commonly used to soothe irritated and damaged skin, stimulates fibroblast growth, strengthening the skin’s outer layers. Sodium Hyaluronate is a form of Hyaluronic Acid, which is an extremely versatile substance naturally present in the human body. It helps to hydrate the skin. This cream also contains Allantoin, Safflower Oil, and Hyaluronic Acid, which were mentioned above. I would recommend this cream for mature, dry and normal skins. It is a heavier cream. To use this cream, apply a small amount every night on clean skin. Massage until cream is fully absorbed. For best results, apply after Regenerative Multi-Action Concentrate. I have normal to dry skin. In the summer it is more normal. I used this cream and found it to be a heavier cream that is definitely suited for more mature and drier skins. It is definitely moisturizing. I like the fact that it has so many good ingredients in it. The anti-aging properties of this cream are tremendous, so that they would work well for those seeking to use them for anti-aging purposes. The entire GX-Life Radiance Skincare Set retails for $360.00. The total of all of the products purchased separately totals $424.75. That is a savings of $64.75, a significant savings. Should you decide you would like to purchase these products, I would definitely get the entire system for the savings. Dr. Js Natural is available to purchase on www.drjsnatural.com, www.amazon.com and www.bulubox.com. Like Dr. Js Natural on Facebook: https://www.facebook.com/drjsnatural; Follow Dr. Js Natural on Twitter: @/DRJSNATURAL; Follow Dr. Js Natural on Instagram: http://instagram.com/drjsnatural; Subscribe to Dr. Js Natural on YouTube: https://www.youtube.com/c/drjsnatural?sub_confirmation=1 and Add Dr. Js Natural on Snapchat: https://www.snapchat.com/add/drjsnatural.